"International Composition Prize 2004, World Premiere Recordings": Chañaral Ortega-Miranda, "Q'inti"; Lin Wang, "Lin Lang"; Satoru Ikeda, "Fireworks"; Matteo Franceschini, "Làbara"; Jonathan Eato, "Bling Bling Balaam". 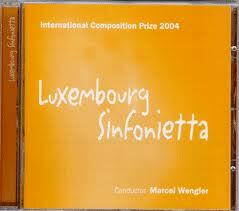 Luxembourg Sinfonietta, Conductor: Marcel Wengler. CD LGNM No 404.